Do you ever feel like today's tech driven society is taking over your LIFE and your Momma-hood? If you said yes, then you're in for a treat today! 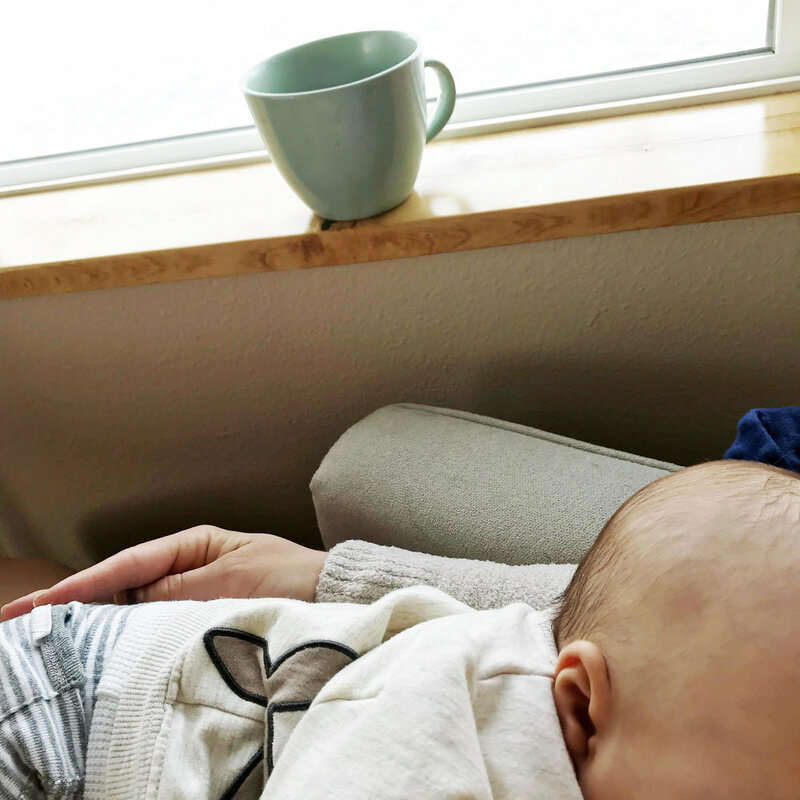 As a leading force in the Momma + health field, I feel strongly about shining light on areas that need to be talked about and the obsession with social media and showing up half-awake and half-commited each day is the topic I'll be tackling for us today! So. What's the deal? Why are SOOOOO many of us today OBSESSED with Motherhood but neglecting to be fully present? (See my motherhood journey over on Insta!) I've got my take on this and some juicy tips for you to start living more PRESENT below! OUCH! I love technology you guys. I really do. But I OWN IT. I tell it what to do and when. I don't scroll mindlessly. I don't waste time on social. I get in at set times during the day, share with our Blossoming Mommy and Baby community and then I'm out! So, what does this mean for you? Check yourself! How often are you scrolling mindlessly on social? Are you following people who are constantly causing you to contrast and compare your life to theirs? Do you check your phone every hour? The stats these days are CRAZY. We're spending hours a day on our phones and for what? We're ADDICTED and it's time we as Modern mommas wake up! As a society, we waste SO MUCH TIME on our phones and life (and Mommahood) is literally slipping away. Don't spend your kid's childhood staring at your screens. (How about making some cozy treats like gluten free and uber moist banana bread?! Your house will smell AHHHMAZE!!) Utilize your settings. Turn off notifications. Put your phone away at night. Set certain times during the day where you will check in with social. Unfollow those that don't inspire, educate, or encourage you. Then, when you're ready to take your mental health to the next level, unwrapping levels of happiness and living truly present, come into our next class of Grounded and Glowing! Your online program for living your happiest and healthiest. Ah, the schedule. Something we hear ALL the time. Now, don't get me wrong! I'm all about that schedule! In fact, I live by it... but it must be done right. Here's what I mean.... In order to truly be present with our family, our days have to be organized. This means time blocking and prioritizing the day ahead for your family. This does not mean to over schedule your kids, yourself, or your home. It’s your job as a modern mom to protect your priorities. In today's society, it's WAY to easy to get whisked away into the hustle bustle of those around us. So here’s what I want you to do to ensure that your schedule is powerful and effective for your family: only schedule things that have to get done. This includes appointments, school or work, and other must dos. Then, you can filter in or out extracurricular activities like sporting events or other desired hobbies of your family. Make sure that your kids, yourself, and your husband have quiet time each day together as a family. We live in a culture that SCREAMS "children have to be entertained every second of the day." This is false mamas! It’s so important to have downtime as a family. Cozy up with a good book, sit around the fire and share stories together, go outside, have quiet time in your room. Whatever this looks like to you it is vital to have space in your day to breathe and to just be. ♥️ And let’s face it, is there anything better than a cozy cup of coffee or a decadent hot chocolate, piled hight with marshmallows for the kids? Learn to make magical moments in the mundane. Have a family game night or do crafts together. It’s the simple life and it’s the best. For more on this, be sure to take a look inside Blossom After Baby. Tip #3: Practice being intentional and in the Moment. Whether you’re in the season of diaper explosions and wee of the night feedings (Hi there.... this is me! ), school aged drop offs, or the college years, living intentionally and with stillness is a magical, life giving skill you can STILL harness. This has been such an eye opener for me as we learn the ins and outs of the newborn life. At times when I have felt my heart longing for “work”, God has used this season to show me the beauty of slowness, intentionality, and creating magical memories in the now. You see, this is the magic..... NOW. Remove unnecessary activities and time wasters. When you’re with your kids, stop multitasking. Don’t breastfeed and stalk Facebook. Don’t instagram bath time. You don’t have to share every moment of your life in Social media and you shouldn’t. Get down on all fours and play with your kids. Turn the tv off. Get outside. Make dinner or bake up cookies together. These are the years, Mommas. Embrace this season! And remember, don’t watch it from your phone! THIS is the Blossoming Mommy and Baby Way. 🌷 If you LOVED this article and podcast episode, please be sure to share with a friend!